Early beds were little more than piles of straw or some other natural material (e.g. a heap of palm leaves, animal skins, or dried bracken). An important change was raising them off the ground, to avoid drafts, dirt, and pests. 23-5 million years ago, before the advent of humans, apes began creating beds composed of a sleeping platform including a wooden pillow. Bedding dated around to 3600 BC was discovered in Sibudu Cave, South Africa. The bedding consists of sedge and other monocotyledons topped with the leaves of Cryptocarya woodii Engl. Beds found in a preserved northern Scottish village, which were raised boxes made of stone and likely topped with comfortable fillers, were dated to between 3200 BC and 2200 BC. 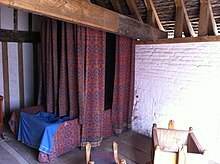 The Egyptians had high bedsteads which were ascended by steps, with bolsters or pillows, and curtains to hang around. The elite of Egyptian society such as its pharaohs and queens even had beds made of wood, sometimes gilded. Often there was a head-rest as well, semi-cylindrical and made of stone, wood, or metal. Ancient Assyrians, Medes, and Persians had beds of a similar kind, and frequently decorated their furniture with inlays or appliques of metal, mother-of-pearl, and ivory. The adjacent image showcases a headrest. Headrests like this were used in life to support the head while sleeping. They are also found supporting a mummy's head in the coffin. This headrest perhaps was made specifically for the tomb, since the offering prayer has been inscribed on the supporting column, although the prayer may have been added after the death of the owner. Louis XI is credited with its first use and the custom lasted until the end of the monarchy. 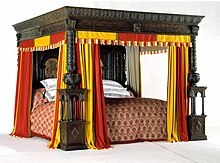 In the chambre de parade, where the ceremonial bed was placed, certain persons, such as ambassadors or great lords, whom it was desired to honour, were received in a more intimate fashion than the crowd of courtiers. At Versailles women received their friends in their beds, both before and after childbirth, during periods of mourning, and even directly after marriage—in fact in any circumstances which were thought deserving of congratulation or condolence. During the 17th century this curious custom became general, perhaps to avoid the tiresome details of etiquette. Portable beds were used in high society in France until the end of the Ancien Régime. The earliest of which mention has been found belonged to Charles the Bold. They had curtains over a light framework, and were in their way as fine as the stationary beds. 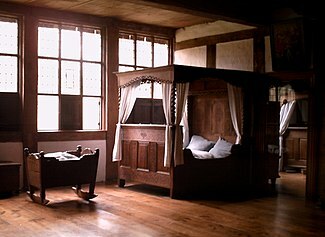 A mourning bed ("illustration") is a formal canopied bed, with the deceased, a wax effigy, or symbols of rank. Although not truly parts of a bed frame, headboards, footboards, and bed rails can be included in the definition. Headboards and footboards can be wood or metal. They can be stained, painted, or covered in fabric or leather. ^ "Bed". The Free Dictionary By Farlex. Retrieved 16 May 2012. ^ "Bed". Merriam-Webster. Retrieved 16 May 2012. ^ "Chimpanzees Make Beds That Offer Them Best Night's Sleep". National Geographic News. 18 April 2014. Retrieved 30 March 2018. ^ "Skara Brae – The Furniture". orkneyjar.com. ^ "Headrest with Two Images of the God Bes". Retrieved 8 July 2014. ^ "Definition of CHARPOY". Retrieved 30 December 2016. This article incorporates text from a publication now in the public domain: Chambers, Ephraim, ed. (1728). "article name needed". Cyclopædia, or an Universal Dictionary of Arts and Sciences (first ed.). James and John Knapton, et al. "BED". History of Science and Technology. ^ a b "Medieval Furniture & Home Decor". furniturestyles.net. Retrieved 26 November 2010. ^ "TCTerms - Standard-double vs. Standard-twin (English)". www.translatorscafe.com. Retrieved 31 October 2017. ^ "Even Beds Go King-Size" Popular Mechanics, December 1954, p.128, bottom of page. ^ "The Golden Bed". Victoria and Albert Museum. Retrieved 26 May 2013. ^ Independent. "India's royal riches: The maharajas' opulent lifestyle". Retrieved 31 July 2017. ^ Brooklyn Museum. "Decorative Arts: Convertible Bed in Form of Upright Piano". Retrieved 11 March 2012. ^ (in English) "Bed (Lit à la Polonaise)". getty.edu. Archived from the original on 1 March 2009. Retrieved 26 January 2009. ^ "Captain's bed". Dictionary.com. Retrieved 26 May 2012. ^ "Historical Guide: Bed Hardware". whitechapel-ltd.com. Archived from the original on 12 March 2006. ^ "Bed Rail Fastener Options". home-improvement-and-financing.com. ^ "Bed Safety Rails". sleepcompare.com. Retrieved 15 November 2018.